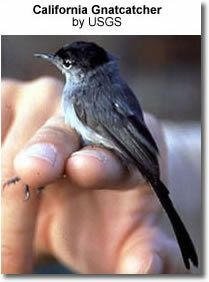 The gnatcatcher family can be found in North and South America. Most of the16 species of this mainly tropical and sub-tropical group are resident, but the Blue-gray Gnatcatchers of the USA and southern Canada migrate south in winter. Their preferred habitat is the open woodland or scrub. The gnatcatchers are mainly soft bluish grey in color, resembling Old World Warblers in their structure and habits. Monogamous pairs are formed shortly after the return to the breeding range, in late March or April. They nest in bushes or trees.The nest is built by both the male and female, and takes nearly two weeks to complete. Three to five eggs are layed 5-10 days after construction is finished. The male and female both incubate. After another two weeks the young hatch. Both parents bring food to the young. Although both the male and female contribute to the care of the eggs and hatchlings, they do not interact with one another after incubation begins, seeing each other only in passing. They often fledge a second brood together later in the season. Gnatcatchers eat mainly small insects and spiders.